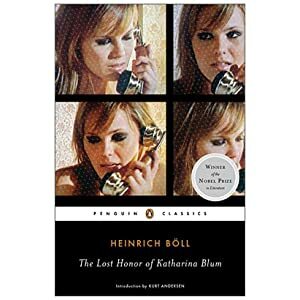 The Lost Honor of Katharina Blum isn't the normal sort of book that I review on here, but I've been hard pressed to find time for books that I didn't have to read for a class lately. This book is a crime novel set in Germany - it's very interesting because within the first chapter, the main character has shot a journalist (who apparently deserved it) and has confessed to her boss and then to the police. We also get the gist that she is wanted for a crime that she seems to be innocent for. Then there is another body, but when asked about his death, an alibi is provided from her, despite her words "Why not him too?". The words puzzle the inspector because her response is a question, not an admission of guilt. While the story is written in a very journalistic way, the story is very interesting, especially for a book that was required for a class. If you don't go out and read the book (Contact me, you can borrow my copy! ), then at least watch the movie with English subtitles.